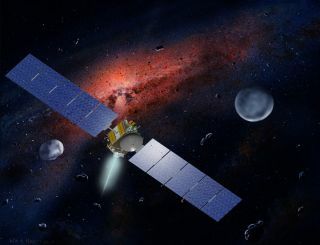 Artist's concept of NASA's Dawn spacecraft, which is closing in on the huge asteroid Vesta. A NASA spacecraft has reached a new phase of its mission to Vesta, the second-largest asteroid in the solar system, and is on track to arrive at the huge space rock in July. The probe, NASA's Dawn spacecraft, is now using cameras for the first time to aid its approach to Vesta, a massive asteroid that many astronomers classify as a protoplanet. If all goes well, the ion-propelled probe should enter orbit around Vesta on July 16 to begin a year-long study of the mysterious space rock. At 329 miles (530 kilometers) wide, Vesta is the second-biggest object in the main asteroid belt between Mars and Jupiter. It appears to have layers – a core, mantle and crust – just as planets such as Earth, Venus and Mars do. On its southern side the asteroid Vesta shows a huge crater. This picture shows the asteroid in an image taken by the Hubble Space Telescope (top, left), as a reconstruction based on theoretical calculations (top, right), and as a topological map (bottom). But Vesta isn't large enough to be classed as a "dwarf planet" like the other behemoth of the asteroid belt Ceres – hence the "protoplanet" designation. Until now, Dawn has been navigating by measuring radio signals between itself and Earth, and using several other methods that didn't involve Vesta. But as Dawn closes in on Vesta during its approach phase, the spacecraft will use cameras to analyze where Vesta appears relative to the stars. This method should allow mission scientists to pin down and refine Dawn's trajectory very precisely, researchers said. "After more than three and a half years of interplanetary travel, we are finally closing in on our first destination," said Dawn chief engineer Marc Rayman, of NASA's Jet Propulsion Laboratory in Pasadena, Calif. "We're not there yet, but Dawn will soon bring into focus an entire world that has been, for most of the two centuries scientists have been studying it, little more than a pinpoint of light." During the approach phase, Dawn will train its various instruments on Vesta. For example, the spacecraft will snap photos that may reveal moons around the space rock. None of the images from ground-based and Earth-orbiting telescopes have seen any moons, but Dawn will give scientists much more detailed images, researchers said. Dawn's gamma ray and neutron detector instrument will also gather information on cosmic rays during the approach phase, providing a baseline for comparison when Dawn is much closer to Vesta. At the same time, the spacecraft's spectrometer will take early measurements to ensure it is calibrated and ready when the spacecraft enters orbit, researchers said. Dawn launched on Sept. 27, 2007. By the time it reaches Vesta, it will have traveled about 3 billion miles (4.8 billion km). The probe will stay in orbit around Vesta for one year. After another long cruise phase, Dawn will arrive at its second destination, the dwarf planet Ceres, in 2015. Studying these two icons of the asteroid belt should help scientists unlock the secrets of our solar system's early history, researchers said. Dawn's mission will compare and contrast the two giant bodies, which were shaped by different forces. Dawn's instruments will measure surface composition, topography and texture, and the probe will also measure the tug of gravity from Vesta and Ceres to learn more about their internal structures.